With its emphasis on quality of life, Irvine is perennially cited as one of the best cities in America to live in – and it’s easy to see why. For starters, it’s been named one of the safest big cities in the country by the FBI every year since 2006. The city has also been expertly master-planned to make living here more convenient. The roadways, for example, have been designed to reroute traffic by shifting stoplight patterns. Hence, you can expect fewer traffic jams and safer travels on the road. Irvine has a robust job market that attracts the best and the brightest minds. The business-friendly city is home to a wide array of industries, from filmmaking, to technology, to academia, and more. Unemployment in the city remains in the low single digits, leading WalletHub to call it one of the top 10 cities for job seekers. 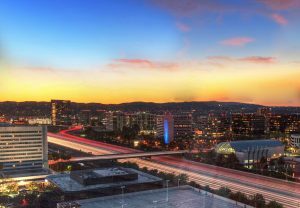 One-third of the Fortune 500 companies in the world are headquartered in Irvine. And we can’t talk about Irvine without mentioning that it’s one of the country’s top college towns. It’s home to no less than 10 higher education institutions, including the prestigious University of California – Irvine. Not surprisingly, Irvine residents are a brainy bunch – the city has the highest percentage of doctoral degree holders. And the commitment to quality education extends to Irvine’s public schools as well. Its five high schools are managed by the Irvine Unified School District, and the schools consistently rank in the upper reaches of Newsweek’s top high schools in the country. Oh, and did we mention that the weather here is fantastic? Even in the winter, temperatures rarely dip below 45°. Architect William Pereira and Raymond Watson designed Irvine’s world-class masterplan. Neighborhoods are divided into “villages,” each of which has been designed to be self-sufficient. Homes in these villages feature similar architectural styles and provide easy access to schools and everyday conveniences. Given the excellent quality of life in Irvine, real estate here commands top dollar. Though prices vary depending on location and the home’s features, properties typically start at the mid to high six figures and go all the way up to the multimillion range. You’ll find different architectural styles, property types, and floor plans to suit your family’s needs. Single-family homes are predominant though there are also duplexes, condos, and townhouses as well as some lots in the newer neighborhoods. Irvine’s villages range from the well-established, pedestrian-friendly University Park and Woodbridge to exclusive, gated Shady Canyon with its sprawling estates. Among the newest villages are Orchard Hills, Hidden Canyon, Eastwood, and Portola Springs. Irvine is a brainy city, but it also has an artistic streak, which is on full display at this museum. Drop by to see American Impressionist work from the 1890s-1930s. This 300-acre freshwater marsh has more than 11 miles of nature trails for you to enjoy. There’s also a boardwalk where you can take in the beautiful view. While parts of it are still in the planning and constructions stages, this expansive regional park already has a host of facilities and attractions that residents can enjoy, from the Great Park Balloon and Carousel to the Certified Farmers Market, Farm + Food Lab, Palm Court Arts Complex, and Great Park Sports Complex.